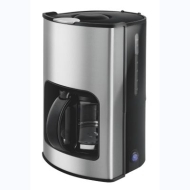 alaTest has collected and analyzed 15 reviews of ASDA Stainless Steel 1.5 Litre 12 Cup Coffee Maker. The average rating for this product is 4.5/5, compared to an average rating of 4.4/5 for other products in the same category for all reviews. People are impressed by the capacity and size. The design and usability are also appreciated. We analyzed user and expert ratings, product age and more factors. Compared to other products in the same category the ASDA Stainless Steel 1.5 Litre 12 Cup Coffee Maker is awarded an overall alaScore™ of 83/100 = Very good quality. Good value for price payed, looks good and coffee is good. only complaint being having to be extra careful when pouring into cups. pouring spout a bit to wide. This does everything you need and in quick time. Yes it's basic, but what more do you want for a bargain price. It also looks good. does everything we need it to, looks good too. Makes a nice cup of coffee. would recommend this coffee machine to everyone, looks good easy to use and makes fab coffee in minutes. And for £20 you can't go wrong. makes a nice cup, works well, good quality, but the only down side is that it doesn't make a hot enough cup of coffee . Very good value for money. Looks stylish in my kitchen and makes a good cup of coffee also keeps it nice and hot. A great machine for the price.